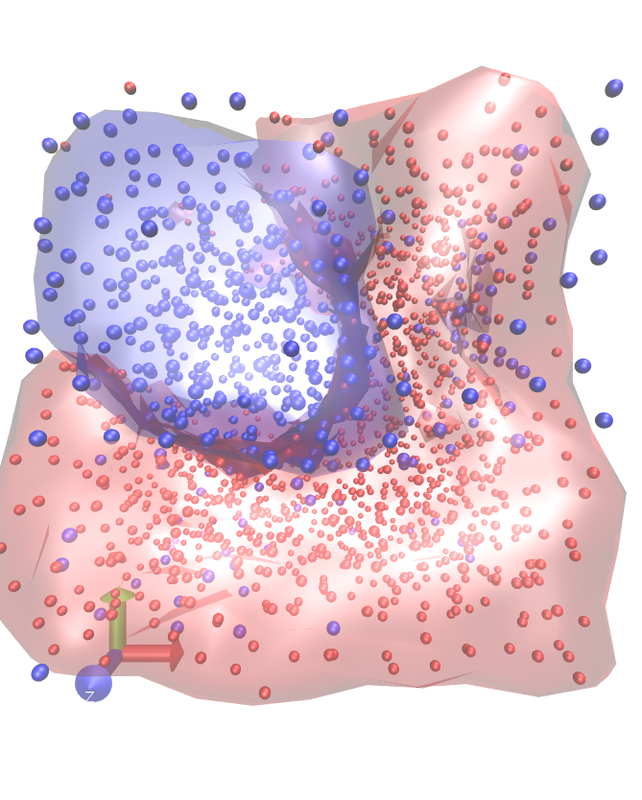 The figure displays a view into a simulation box containing hydrogen (red spheres) and helium (blue spheres). The transparent envelopes are the respective isosurfaces of locally averaged ion density. One can easily see that the helium has accumulated in a small region. The system is obviously demixing under these extreme conditions (6000 K, 20 Mbar, 4 g/cm³). This effect was predicted long ago, and it has now been observed directly in a ab initio simulations. A key aspect of our research is to perform accurate calculations of thermodynamic, structural, and transport properties of matter under extreme conditions typical for the interior of astrophysical objects (about 103 - 106 K, 1 GPa - 100 Mbar). Generating and analysing such extreme states of matter in laboratory experiments is very challenging. Therfore we use a numerically demanding but very powerful theoretical method to describe many-particle systems with strong correlations and quantum effects. We treat the electrons of the system with finite-temperature density functional theory (DFT) in combination with classical molecular dynamics (MD) for the nuclei. The respective forces on the nuclei are derived self-consistently within DFT at each time step. This simulation method is implemented in the Vienna Ab-Initio Simulation Package (VASP), which we frequently use in our group. The procedure has high numerical demands, hence we routinely employ parallel high-performance computers. Presently we focus on the light elements hydrogen, helium, lithium, beryllium, boron, carbon, but also on molecular systems like water, ammonia, and methane as well as their mixtures. Selected heavier materials like iron or minerals are of great relevance, too. Phase transformations and demixing processes under extreme conditions are of special interest in this context. To understand these phenomena we calculate equation of state data and structural properties like pair correlation functions and structure factors. Transport properties such as the electrical and thermal conductivity, the viscosity, and optical properties are determined as well. To some extent, our results are directly processed further in our research group to model the interior structure of giant planets like Jupiter, Saturn, Uranus, Neptune, and exoplanets (see High Energy Density Physics and Planetary Physics). We also perform calculations related to dynamic compression experiments that are used to create and probe extreme states of matter in the laboratory (see Interaction of correlated matter with intense radiation).